What a great evening! A full house came out to pack Perry's and dance until the wee hours of the morning with Oracle. 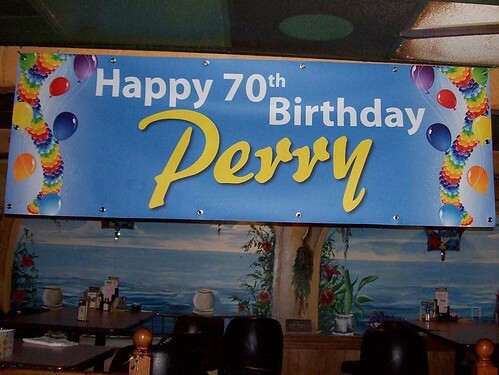 It was a very special evening as we were celebrating Mr. Perry's 70th birthday. As we've mentioned before, it was Mr. Perry's that really believed in Oracle early on and booked the band back before we had the following that we do today. We also had several other birthday celebrations going on...including our long time friend Jay. As a special birthday gift to Jay we are not going to mention exactly WHICH birthday he was celebrating! We noted in a previous post that Oracle has outgrown the stage at Perry's, so sound engineer Steve was set up out in front doing sound the way sound engineers are SUPPOSED to do it...from a spot out on the house. Steve was enjoying himself thoroughly as, freed from the confining spaces of the Perry's stage, he was permitted free reign over the club to listen, mix, and of course take PHOTOS!